A significant contribution to the field of infection control came from a African man sold into slavery in the 1700s. While his birth name has been lost to history, he was given the name Onesimus by his owner, theologian Cotton Mather. Despite owing nothing to a nation that had so viciously stolen him from his homeland and taken away his freedom, Onesimus played a pivotal role in helping Boston avoid a massive smallpox outbreak. His detailed descriptions of how he had undergone a medical procedure as a child that exposed him to smallpox and thereby protected him from further infection was so convincing and accurate, that it was put in place by Mather and local doctors. This mass inoculation - vehemently opposed at the time - saved the lives of hundreds of Bostonians decades before Edward Jenner discovered the vaccine in 1796. Dr. Smith was born in 1813 to a woman who was a slave; his freedom from birth came as a result of New York's "gradual abolition" policy that meant the children of slaves could not be forced into slavery themselves. He received as good an education as was possible to an African-American of his time, but his performance was so exceptional that he completed all available coursework within just a few years. When American universities denied him admission due to his race, he was forced to continue his education in more progressive parts of the world. Dr. Smith would graduate at the top of his class from the University of Glasgow in Scotland and complete his medical internship in Paris. He was again faced with discrimination upon his return to the United States, where he was denied membership in the American Medical Association and denied employment as a physician. He was able to open his own practice, but in 1846 he chose to become the lead physician at the Colored Orphan Asylum, where he took care of both the health and the education of over 1000 African-American children. Dr. Smith successfully averted outbreaks of disease from measles to smallpox through his vaccination program, while also protecting the children from rioting and fires due to civil unrest. Dr. Smith would spend his life dedicated to health care, the abolitionist movement, and the dispelling of pseudo-science defenses of racial discrimination. Another scientific prodigy, Dr. Hinton was born in 1883 to emancipated slaves in Chicago, IL. He sped through his early education, becoming the youngest graduate in the history of his high school. He went on to complete his undergraduate degree ahead of schedule, and would have kept up the pace had he not hit financial obstacles to funding his graduate education. After saving money from his work at a law office and as a science teacher (all the while furthering his bacteriology studies during the summers at the University of Chicago), he enrolled at Harvard Medical school in 1912, where he would receive two consecutive awards of the Wigglesworth scholarship, the University's most prestigious merit-based award. Despite his exceptional skills and training, young Dr. Hinton was unable to secure a position as an intern to complete his medical degree - he was repeatedly denied due to his race. Undeterred, Dr. Hinton accepted a lab position at the Pathological Laboratory at Massachusetts General Hospital. Within three years, he was running the lab. In 1915, he was appointed Director of the Laboratory Department of the Boston Dispensary and as Chief of the Wasserman Laboratory of the Massachusetts Department of Public Health (which soon became known as the "Hinton Laboratory"). While his scientific contributions are too numerous to list, his most lasting legacy was his creation of a fast and accurate test for syphilis, a notoriously difficult infection to treat once it has progressed. In additional to his scientific discoveries, Dr. Hinton also left a legacy to future microbiologists: He was a professor of microbiology at Harvard Medical School, he founded a laboratory technician training school for women, and mentored countless students for decades. Today, he is remembered not only for his "Hinton test," but also for the groundbreaking work he did at the Wasserman lab, which in 1975 was renamed the Dr. William A. Hinton Laboratory. Dr. Amos was born in New Jersey in 1918 and went on to attend a segregated school in Philadelphia. His education was supplemented by his mother, a well-read and self-educated woman who had access to the enormous library maintained by her employers, a prominent family. One day, his mother selected a book about Louis Pasteur for her son, sparking a life-long fascination in microbiology. His precocious academic ability allowed him to graduate at the top of not only his high school class, but also his undergraduate class at Springfield College where he majored in biology and chemistry. His graduate studies were delayed by a draft into the Army during WW2, but upon his return he began his medical studies at Harvard Medical School, where he earned both his MA and PhD. Dr. Amos would continue to study with his Harvard mentor, completing postgraduate work in virology. His discoveries earned him a Fulbright Fellowship to study at the Pasteur Institute in Paris, bringing his life full circle to that first book brought home by his mother. His countless contributions to the field of microbiology include groundbreaking work in the RNA, including the use of bacterial RNA to synthesize biologic materials such as insulin. Dr. Jemison, along with being the first African-American woman in space, is a world-class physician and researcher. Her childhood was full of science and exploration; even a childhood infection could be transformed into a learning experience by her mother, a math teacher. At just 16 years old, Dr. Jemison was a freshman at Stanford University, having received the coveted, merit-based National Achievement Scholarship. But before she would don her NASA spacesuit and begin a career as an astronaut, Dr. Jemison was a physician and engineer. She researched vaccines with the Centers for Disease Control and Prevention (CDC) as a medical officer with the Peace Corps, and worked in bioengineering as well. After being the first African-American woman admitted to the NASA astronaut training program, Dr. Jemison served as a member of the crew of the Endeavor mission STS-47, where she conducted medical research, including studies of bone cells. 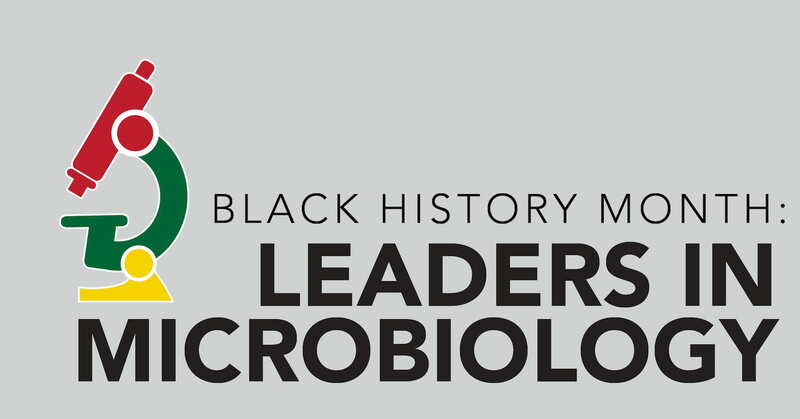 We hope you enjoyed this closer look at just five of the amazing African-American leaders whose contributions to microbiology still help us today. Stay tuned this month for even more insights into fascinating discoveries and groundbreaking research as we celebrate Black History Month!